Sasha Says: RH Baby & Child: Who Knew? Did you know that Restoration Hardware has a baby and child line? I didn't! But I guess they knew how big of a fan I'd be, so they sent me their catalog yesterday (unprompted). Super-smart of them since I of course placed an order today for bedding for WC's big girl full-sized bed. Uh, huh. How gorgeous is that? 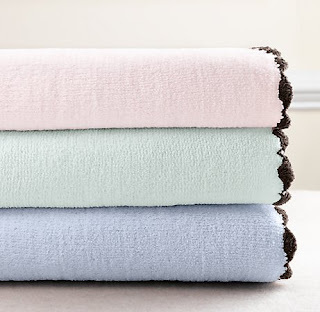 I'm going to use that blanket (on sale for $45- regular price $129) as a coverlet and I got two of the matching standard shams for $10 each (regular price $29). Her bed has a footboard, so we really don't need a bed skirt. 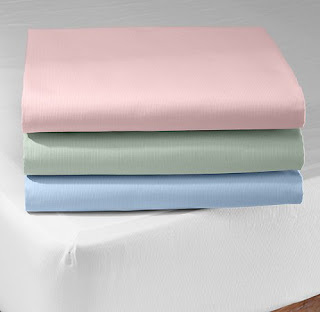 I got this boxspring cover in petal for $40 (regular price $80). 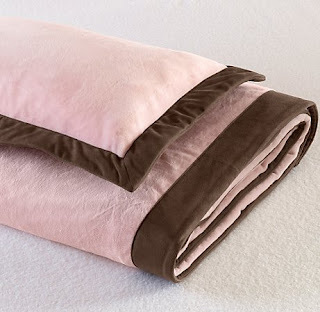 And I also got this darling full-sized blanket in petal/chocolate for $35 (regular price $99). How gorgeous is all that?????? Can't wait to get it. I want to see pics of her bed put together! Watch out if you sign up for their emails - they're almost daily! I'm jealous! I love it all...I'm going right now to see if there are any left! BTW..love the new giveaway site! !